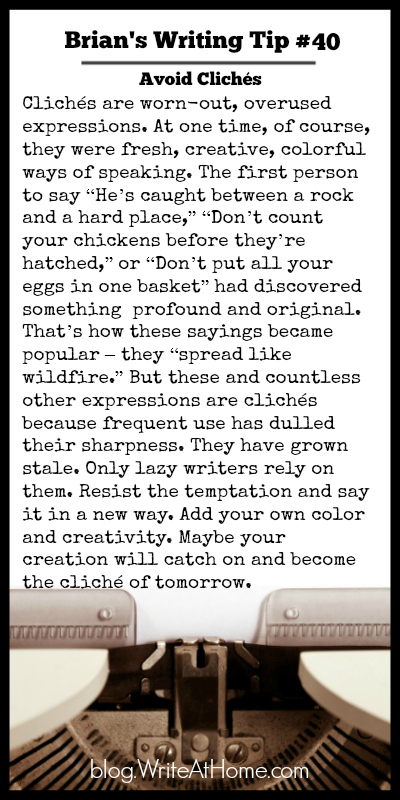 Avoid clichés. Clichés are worn-out, overused expressions. At one time, of course, they were fresh, creative, colorful ways of speaking. The first person to say “He’s caught between a rock and a hard place,” “Don’t count your chickens before they’re hatched,” or “Don’t put all your eggs in one basket” had discovered something profound and original. That’s how these sayings became popular – they “spread like wildfire.” But these and countless other expressions are clichés because frequent use has dulled their sharpness. They have grown stale. Only lazy writers rely on them. Resist the temptation and say it in a new way. Add your own color and creativity. Maybe your creation will catch on and become the cliché of tomorrow.